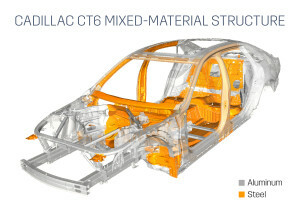 General Motors will restrict structural parts on the aluminum-intensive 2016 Cadillac CT6 to a specific network of dealer and independent collision repairers, Cadillac officials said Friday. The network will “probably more closely align” with luxury car programs like Audi and Mercedes’, General Motors wholesale dealer channel manager John Eck said during a class at the NACE 2015 event in Detroit. Cadillac’s Leo Gruzas said the network would seek to have “proper geographic coverage” and have some sort of ceiling on how many can join in a particular market. He gave a ballpark guess that it’d have about 100 shops nationwide. Cadillac will only produce 25,000 of the CT6s in the first year of the model’s existence. Joe Villanueva of Cadillac couldn’t provide an estimate of how much the equipment would cost a shop; Cadillac hasn’t completely finalized tool specs and brands yet anyway. However, Eck noted that “We don’t anticipate too many” dealers joining the program because of the cost. Gruzas couldn’t say what the cost of the required Raytheon courses would be or if that would be part of the cost to sign up for the program; GM hasn’t determined that yet. He wouldn’t disclose the cost to sign up for the program. “Structural pieces will be restricted,” Eck said, and Cadillac won’t sell you the parts unless you’re part of the Cadillac Aluminum Repair Network. “That maintains the integrity of the repair,” Eck said. You also can’t get the measurement data for companies like Car-O-Liner unless you’re part of the network, according to Eck.